A very special thank‐you to Kate of Signed with an Owl, who left a comment on the owl pattern post about using the loop stitch to make a squirrel’s tail, which gave me the idea to try the loop stitch for the fox’s tail. It makes it extra fluffy! Round 1: with white, 4 sc in magic ring, sl st in first sc to join. *Note: As I’ve mentioned in the first woodland creatures post, I’m making these animals for a baby mobile so I’m making them flat, but all of the patterns are designed with double layers for sturdiness, and you can always slightly stuff them so they’re a bit more 3‐dimensional and plush‐like. For the fox, now would be good time to stuff the head before the ear row. Press the top opening of the head flat so that the stitch on the hook is on the top corner edge of the head. We’re now crocheting through both layers of the head. ch 2, 2 dc tog over the next 2 sc, ch 1, sl st in top of 2‐dc‐tog just made, ch 2, sl st in the second st of the 2‐dc‐tog, sl st in next 4 sc, ch 2, 2 dc tog over next 2 sc, ch 1, sl st in top of 2‐dc‐tog just made, ch 2, sl st in last sc on the top corner edge of the head. Fasten off. Round 1: With orange, 6 sc in magic ring, do not join. Continue making 1 sc in each sc around until piece is 1″ tall. Next row: *1 sc in next sc, 2 sc tog over next 2 sc*, repeat from * to * 3 more times. 1 sc in each sc around until piece is 1.75″ tall. Now is a good time to stuff the body if you’d like. Next row: *1 sc in next sc, 2 sc tog over next 2 sc* twice. Last row: 1 sc in each sc around, fasten off, leave a tail for sewing. Tail is crocheted in rows. With orange, leaving a 6″ tail for sewing, ch 3. Row 1: sc in second ch from hook, sc in next sc, turn. Row 2: ch 1 (does not count as a stitch), lp st (loop stitch) in each sc across, turn. Row 4: ch 1, lp st in first st, 2 lp st in next st, turn. Row 6: ch 1, lp st in first st, 2 lp st in next st, lp st in last st, turn. Row 7: ch 1, lp st in first st, 2 lp st in next st, lp st in each st to end, turn. Row 8: switch to white, ch 1, lp st in first st, skip next st, lp st in each st to end, turn. Row 9–10: repeat row 8. There will be 2 loop stitches in the end, fasten off, weave in all ends. Embroider the white inner ears, nose, and eyes. *Tip: Insert sewing needle into the white part of the head on the back when embroidering, and always tie off in that part, because it will be covered by the neck part of the body when attaching the body to head. Attach body to head by sewing together the top row of the body to the first row of orange (after the white part) on the back of the head, sewing through all layers of the body to the head. Attach tail to bottom of the back of the body. Ah! Too cute Trish!! The tail is PERFECT! I really hope I can find time to make some of your lovely animals! thanks soooo much for the idea kate! i think i will make other animals with fluffy tails this way, and probably remake the squirrel too! Adorable! 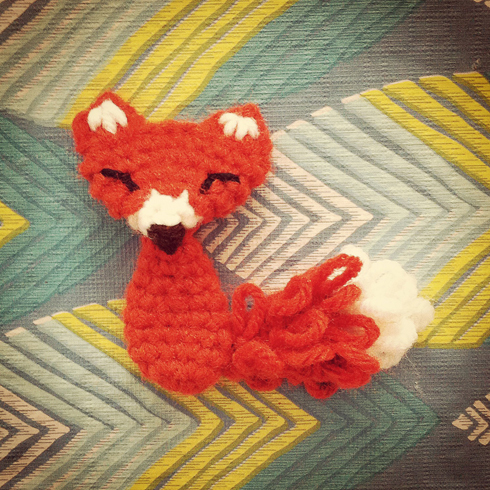 I’ve added all your Woodland Creatures to my projects in Ravelry. Have finished the Hedgehog, so cute! Am currently finishing 70‐squares roses afghan. But can hardly wait to work further on your creatures!! Hello from the Windy City Chicago! i love the windy city! and wow, 70 squares of roses! that is going to look so amazing! thanks so much for trying out the woodland creature patterns! thanks so much for visiting, Alexandra! hmm, i’m not sure if the fox will keep its shape for long if it’s actually used as a key chain (i.e. with keys on it, being taken in and out of purses or bags repeatedly). but if it’s only used as a decoration it would be fine (i.e. hanging the key chain on bags or backpack). if you’d like to order one please visit my etsy page (the link is on the right sidebar of the blog) and add a note let me know that you want it to be a key chain when you place the order :) cheers! Thanks for share this pretty pattern with us. Danke für dieses süße Muster,Ich werde diesen Fuchs als Brosche verwenden.Und meine Enkelkinder werden mich beneiden. Werde wohl noch ein paar von diesen süßen häkeln müsse.Aber das ist ja schnell geschafft,wenn ich erst richtig übersetzt habe. Hi, this is so cute. I made my new grandson an afghan and it just needed something extra to make it fit his nursery and look more babyish. I am however finding the body a bit hard to understand. Could you please help. Hi Barb! Thank you for giving my pattern a try. For the body, start with 6 sc in magic ring, then for the next round 2 sc in each sc, then round 3, 1 sc in each sc, then repeat round 3 until the piece is 1″ tall. Then, work a decrease row by crocheting [1 sc in next sc, 2 sc tog in next 2 sc] 4 times. Then, crochet 1 sc in each sc until the piece is 1.75″ tall. Then crochet [1 sc in next sc, 2 sc tog in next 2 sc] 2 times. Finally, for the last round, crochet 1 sc in each sc, then fasten off. Love this, too cute! I’m making this for my nephew but was hoping to make it much bigger. Any suggestions on how to make it 4–5 times bigger? hi Brandi! glad you like the fox! 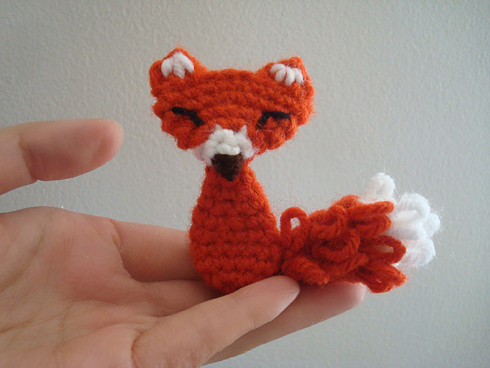 to make a bigger fox, perhaps use super super bulky yarn (like Bernat Blanket” and use a 6.5mm hook? happy crocheting!